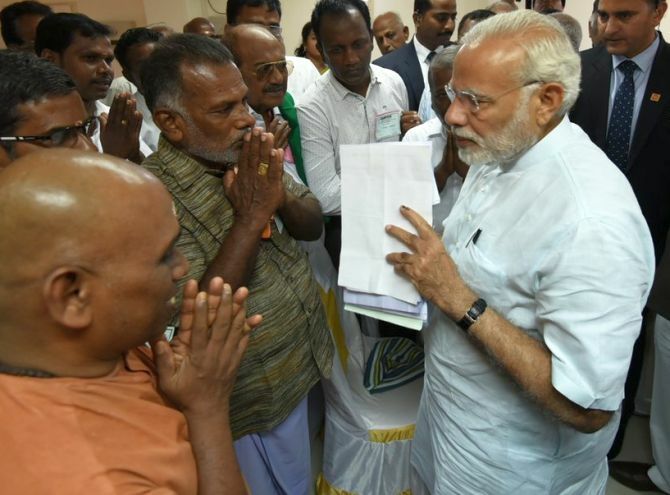 Prime Minister Narendra Modi on Tuesday reached out to the people of cyclone Ockhi-hit areas of Lakshadweep, Tamil Nadu and Kerala and assured them all possible help from the centre to rebuild their lives and trace those missing. Modi said search operations to trace the missing fishermen in Kerala and Tamil Nadu would continue and expressed hope that all of them would come back home before Christmas. "I am here to assure you that India stands shoulder to shoulder with all those affected by cyclone Ockhi. We will leave no stone unturned in the rescue and relief operations," said the prime minister, who addressed a gathering of fisher folk at Poonthura, a fishing hamlet near Thiruvanathapuram. "Some of our people are stranded in foreign nations. The ministry of external affairs and various embassies are working to bring them back. Some people also got stranded in parts of India's western coast. We have rescued many of them," he said. On a day-long hectic tour, Modi held high-level discussions with the chief ministers of Tamil Nadu and Kerala and the administration of the union territory of Lakshadweep and reviewed the situation post-Ockhi. During the meetings, both Tamil Nadu and Kerala demanded a special financial package from the centre to tide over the destruction caused by the natural calamity and wanted the cyclone to be declared as a national disaster. Modi, who reached Kavaratti, Lakshadweep's capital, in the morning, discussed with top officials and people's representatives the situation in the union territory. He also found time to meet some local people, the victims of the calamity, and interacted with them. Lakshadweep administrator Farooq Khan said as per a rough estimate, damage caused due to the cyclone in the union territory, was to the tune of Rs 150 crore. "We are processing the cases of those affected by the cyclone Ockhi to get maximum relief for them. We have conveyed our requirements to the centre," he said. Lakshadweep MP Mohammad Faizal said the administration has sought an immediate aid of Rs 150 crore for rebuilding the basic infrastructure damaged in the devastating cyclone. The MP said Modi has assured all central assistance to the island. Though there was no loss of life or injuries, roughly 1000 houses had been damaged in the island territory, the majority of which are in Minicoy, an official said. At Kanyakumari in Tamil Nadu, the prime minister held a high-level meeting in which Chief Minister K Palaniswami presented a memorandum seeking Rs 9,302 crore central aid. Palaniswami later told reporters that his government sought Rs 5,255 crore assistance towards implementing permanent rehabilitation measures in Kanyakumari and another Rs 4,047 crore to cater to other parts of the state, including state capital Chennai, affected by the north east monsoon. 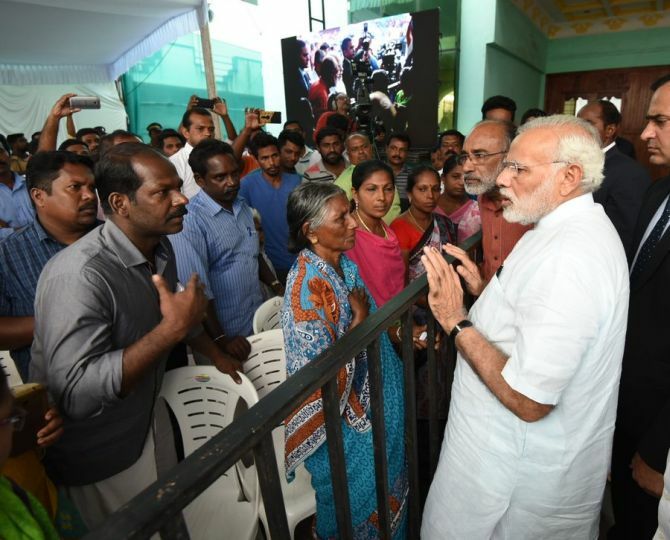 At Poonthura, which bore the brunt of the cyclone, the prime minister gave a patient hearing to weeping women, children and men, who lost their kin and livelihood in the cyclone. "The whole country is with you in this time of sorrow. We will do everything to search for the missing fishermen," Modi said. "...We pray to God that before Christmas, all the missing persons return," the prime minister added. 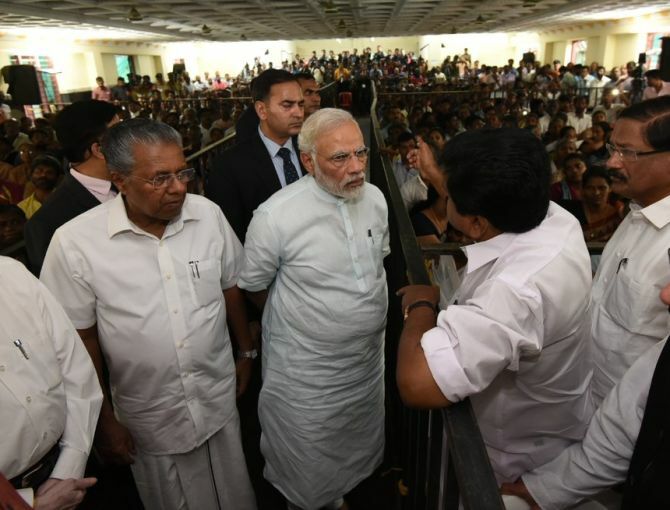 Modi later took part in a a high-level meeting, in which Kerala chief minister Pinarayi Vijayan sought a special central assistance of Rs 7,340 crore for rehabilitation and rebuilding of cyclone affected coastal villages. The prime minister assured the state government that the package would be considered sympathetically, an official release said later.